Posted July 8, 2015 by piet & filed under Brasil, News. Previous workshops and projects on manufacturing and installing the Hugh Piggott wooden wind turbines have been run by the charity ILWP. These projects have tended to use a guyed tower made from several sections of steel scaffold pole welded together in order to elevate the turbines. However, feedback from previous projects found that in many cases the scaffold pole was becoming more difficult and/or expensive to source. Ramboll therefore proposed to design a wooden tower in to sufficiently elevate the turbines, and provide a feasible alternative to using the steel poles so that the building of the turbines and running of workshops could be continued. 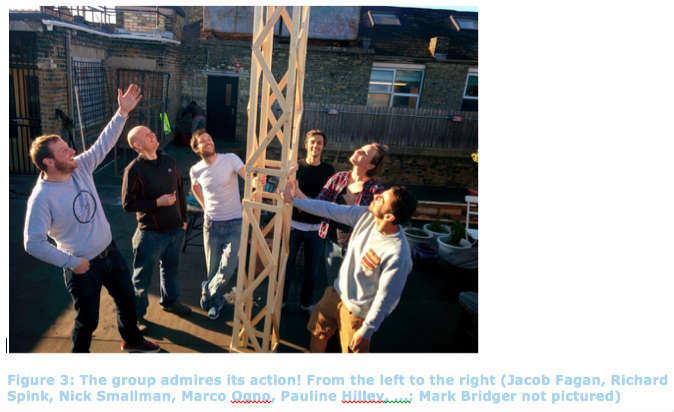 The wooden tower design developed by two volunteering Ramboll’s engineers, Nick Smallman and Mark Bridger, and sponsored by Ramboll’s charity foundation, would later be used in a full wind turbine and tower workshop run this July 2015 in Montes Claros, Brazil. This is going to be the second workshop organized in Montes Claros by Marco Ogno (ILWP) and the local social organization led by Mestre Luis Carlos Afonso (Berimbau de Ouro). 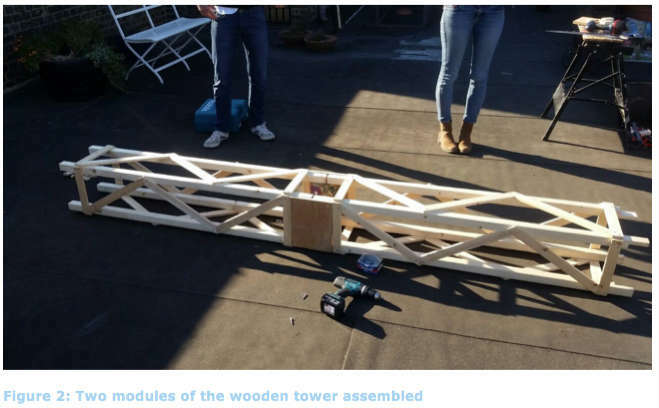 After initial brain storming for ideas, it seemed that a guyed wooden lattice tower would be the best option to develop. A guyed lattice tower would allow for a modular design that would be easy to manufacture, even with access to a limited set of tools, and also be easy to transport and assemble or repair. The use of the guys on the tower would allow for a small footprint at the base of the tower, and the modules could therefore be uniform along the height of the tower, hence a simple repeatable design could be achieved. 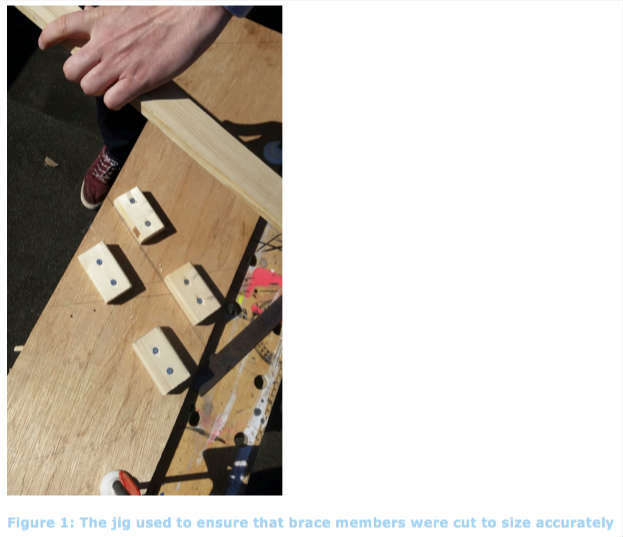 The section sizes of the columns and braces, and the number of brace members and guys required could then be determined. Once the design had been refined, Ramboll decided to build a prototype of the tower in London in order to help solve any problems with the design. Several types of connection designs were considered, and it was decided that a simple flat connection between the columns would be the most realistic and achievable, and a shear plate could be included at the connection between each model in order to transfer the axial loads. 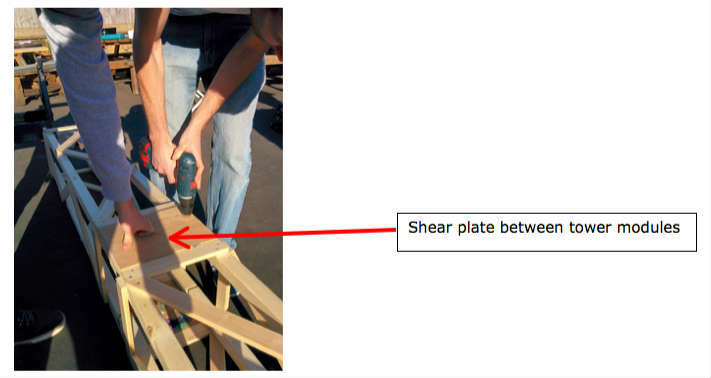 In addition, the importance of using jigs where possible to help ensure that each module/connection was assembled or cut correctly became very clear!